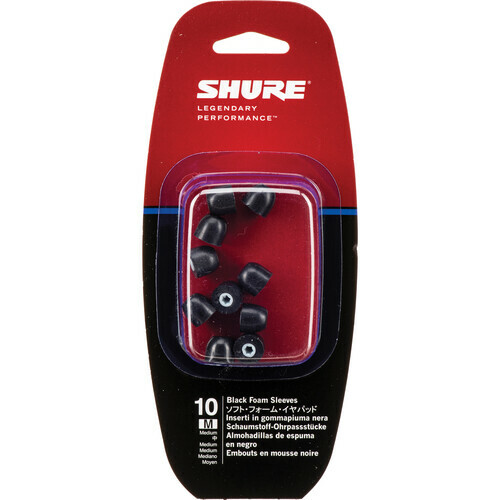 The EABKF1-10M from Shure includes five pairs (10 total pieces) of medium black foam sleeves for the SE-Series, E3c, E4c, E5c, E500PTH, i3c, and i4c in-ear headphones. These sleeves are equivalent in size to the Shure Yellow Foam Sleeves. Note: These ear sleeves are not compatible with the E2c, E2g, i2C, i2c-t, or QuietSpot earphones. Box Dimensions (LxWxH) 5.4 x 2.9 x 1.0"
EABKF1-10M Replacement Black Foam Sleeves for SE-Series (Medium, 5 Pair) is rated 4.9 out of 5 by 17. Rated 5 out of 5 by Anonymous from Now these I can use on an airplane! OK I love the Shure in ear headphones. I own the E-4C headphones and the yellow ear plug type attachments were the only thing that worked for me (my ear canals seem small judged by the silicone fixed sizes available). The bass response was the best with these. What was not the best was the color the yellow foam would turn after 5 or 10 turns in and out of my ears. Do I have dirty ear canals? I don't think so. But I was embarrassed to be seen with these once they were dirty. These new black foam sleeves are a real boon for me! Now I can wipe them with a cloth (they are smooth) and the black does not show any dirt! Yet they perform the same as the yellow foam ones did. Fantastic sound. No issues pulling them out of my ears on the airplane any more. Rated 4 out of 5 by Bryan MD from Better than comply! I have been using the gray comply P series, but eventually got tired of replacing them every 1.5 months (daily use 6 hrs a day). The Shure olives last much longer. I am still using the same pair for 3 months without signs of degradation yet. I would say the the complys are more comfortable, and have slighly more isolation, but I can't just justify the cost of replacing them so often. If you require mission critical isolation, I would go for the complys. If you want the best value, and still excellent isolation and comfort, go with the shures. Rated 4 out of 5 by Martin from Great replacement sleeves I'm using these sleeves with Sennheiser ear buds. They're not designed as replacements for the Sennheiser, but they were recommended to me by a salesperson at B&H who had the same situation I had. I kept on losing the Sennheiser foam sleeves. I also noticed with the Sennhesiers that different sized sleeves had a very different sound, but it wasn't necessarily so that the largest ones also had the best bass. For my ears, I found that the second to largest sleeve gave the best overall frequency response. These Shure replacement sleeves have to be forced onto the Sennheisers. I found I could get them on by twisting. But once on, they're on tightly, so the don't fall off and they have really terrific bass response. I'm really happy with them. Rated 5 out of 5 by Gunga Din from I squish these into my ears These work better than the old ones, because the old ones had lost their love of life. Their once delightful closed cell foam composition had deteriorated into open cell foam. Replacing the previous pads and putting these on was amazing-it felt like I had traveled back in time 9 months to when I previously replaced the foam pads.Even the music sounds different. I'm hearing songs now that were only released days ago. I never heard anything like that with my old pads!... I also enjoy my headphones too. Rated 5 out of 5 by Anonymous from Comfortable, Durable I've been using Shure in-ear earbuds for over 6 years now. The earbud foam sleeves have always been an extremely consistent product. They're far more durable than what you might have experienced with cheaper alternatives or from other vendors. A good damp no-soap cleaning with a paper towel every week can yield a pair that can last a few months at a time. Once they are in my ears, they disappear, form a perfect seal, bringing out the richness of Shure sound technology. Rated 5 out of 5 by Anonymous from Can't go wrong I've had my Shures for about 2 years now and can't say enough good things about them. I primarily use them for motorcycling and find that these foam sleeves provide the best wind noise reduction while listening to my music. So much so that I can still hear my music at highway speeds with the volume down low. Ambient noise is still audible at idle, just a little muted. I wouldn't hesitate to recommend them. Rated 5 out of 5 by Luis from Great performance Purchased these to replace my yellow foam sleeves. Sound quality is very good, although I could venture to say the yellow foam sleeves still have an edge over these ones. These (black foam) sleeves are very comfortable to wear, basically you don't have to roll them in between the fingers before inserting into the ear. As in the case of the yellow foam sleeves, I still think that these are a bit costly. Rated 5 out of 5 by Quanta from Good quality, a little expensive These sleeves are good to replace the sleeves that came with my IEMs after the old ones wore out. They do a pretty good job of isolation, and are very comfortable. They are hard to clean, though, since they are foam. It's nice that so many come in a package, but they still seem a little too expensive.